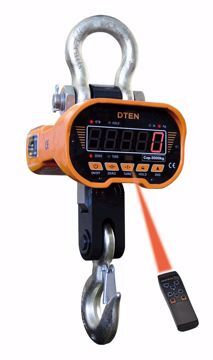 Suitable for bridge cranes Crane scale with shackle and hook Five-digit red LED display (30 mm high). Remote-Control (distance max 10 m). Die-casting aluminium case. Power supply with internal rechargeable; power adapter 230VAC/9VDC to recharge battery. 6V 5Ah battery (autonomy: 80-hour operating time of continuous functioning); 6V 10Ah battery for DTEN10 (autonomy: 140-hour operating time of continuous functioning). HOLD function (block of the displayed weight). Individual weighing and weights totalization. Predetermined tare function. Net weight and gross indicator.